Join us for an unforgettable Adventure, the opportunity to journey into Morocco and follow a world-renowned chef and award-winning author through the delicious cuisine and beautiful culture that serves as a backdrop of her cookbook/memoir, Mint Tea and Minarets. Experience the natural beauty and rich culture of Morocco with Kitty Morse, as she escorts us on this intimate, once-in-a-lifetime ten-day/nine-night tour. 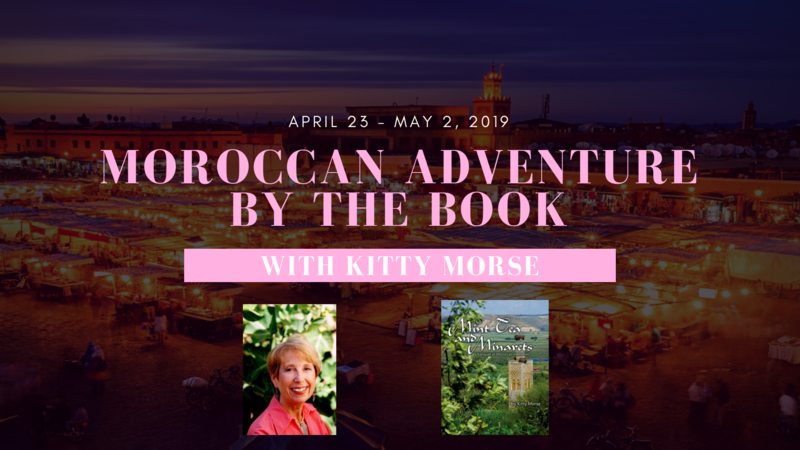 Kitty has honored us with this special opportunity by coming out of her 15 year retirement, specifically to partner with Adventures by the Book on what may be her LAST EVER trip back to Morocco. Award-winning author Kitty Morse was born in Casablanca, Morocco, to a French mother and British father. She emigrated to the United States at the age of seventeen. While studying for her Master’s Degree at the University of Wisconsin- Milwaukee, Kitty catered Moroccan diffas, or banquets, and went on to teach the intricacies of Moroccan cuisine in cooking schools and department stores nationwide. In June 2002, she conducted a Culinary Concert on Moroccan culture and cuisine hosted by Julia Child, as a benefit for the Harry Bell Foundation of the International Association of Culinary Professionals. From 1983 to 2007, Kitty organized an annual tour to Morocco that included culinary demonstrations in her family home, a Moorish riad south of Casablanca. On this once in a lifetime Adventure, you will follow in Kitty’s footsteps as you uncover the provenance of her culinary passion. Over ten incredible days, Adventurers will get to see and experience the alluring country of Morocco from extraordinary and unparalleled perspectives. Beginning in Fez, Adventurers will set out on a running start to explore the countryside of Fez. You will get a real sense of the Roman lifestyle by visiting the ancient Roman ruins of Volubilis and enjoying a special lunch at one of Morocco’s largest wineries. Then we will visit the Imperial City of Meknès, and explore all the city of Fez has to offer for a total of two days. We will then turn our attention to the Sahara, where we will journey out for a camel ride at sunset over the dunes, a night in tents under the stars, and a day visiting Kitty’s favorite Oasis, Tineghir. We will drive to the imposing Todra Gorges, on the Kasbah Trail, and along the Dadès river on our way to Ouarzazate, home to Morocco’s Bollywood industry. We will then make our way to Marrakech, “the Pink City.” Approximately two days are dedicated to Marrakech, with the Marche Central (its French-style central market), Yves St Laurent Gardens, Berber Museum, the Koutoubia Minaret, Saandian Tombs. Finish in Marrakech with an evening at the famous Djemaâ El Fna Square, with its entertainers, singers, dancers, acrobats, jugglers, storytellers, public scribes, soothsayers, medicine-men, dentists, snake-charmers, and more. After leaving Marrakech, we will spend a day in the charming seaside town of Essaouire and end our trip in El Jadida, with a farewell tea at Kitty’s family riad Dar Zitoun. We will relax on the riad’s riverfront terrace, sample local specialties, have our hands hennaed, and enjoy other surprises Kitty has in store for us. With the guidance of the charming and gracious Kitty Morse, Adventurers will have the opportunity to discover and experience the magic of Morocco that is unique to our tour.